LifeNotes: Marriage - What Shaped Your Views? I heard a very interesting question this morning that made me think. The question was, "As a single person, what influenced your views of marriage - your parents, church, or the larger culture (i.e. hollywood, movies, music, etc.)?" As I pondered my response to the question, several things came to my mind. When I was single (which was a long time ago) I don't remember feeling like how so many singles feel today. I didn't have a sense of desperation about me, I didn't make lists and I wasn't looking for someone to complete me. I simply lived and enjoyed my life, and even back then I was considered a bit odd. At some point I caved in, because I wanted to see what all the fuss was about. I learned that if boyfriends aren't Christians and take their walk seriously like I was trying to do, then it wouldn't work. I also realized that if I wanted to keep myself pure, this was going to require major time and effort. Ultimately, I didn't feel very special and wondered what the big deal was, until I met my husband. My parents modeled commitment; they didn't always seem happy but they were together and making sure we understood sacrifice. Partly because of my parents I initially never wanted to get married - they never seem to have any fun; but I guess they did, but I couldn't see it at the time. I've been a church girl all my life and it has had a strong influence on me. I saw the benefit of doing it God's way and somehow that became integral to who I was. I saw young and old couples in church and I also saw what happened to people who chose to do things differently. I read a lot - we couldn't listen to "tuck" (that's what my father called secular music) on the radio and we didn't go to the movies, so reading it was; and I read everything. So I also learned about life, love and marriage from books and magazines. I felt a bit savvy because of the information I learned from reading. I'm thankful for Godly parents that modeled marriage and Christianity and were intent on keeping us from being influenced by the world. I'm also grateful for positive, strong, church families as they fill a gap that's sometimes missing from our biological families and when done right provide you with the tools you need to navigate the culture of the day. 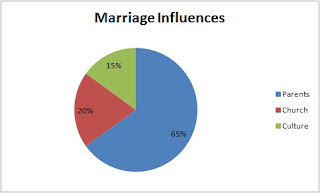 What shaped your views of marriage? Was it parents, church, culture or something else? As a parent, are you cognizant of how you model marriage to your children? I got married at age 18 so I never really lived life as a single adult. What I saw in church and in my neighborhood though was that people got married and stayed that way no matter what. My parents and my husband parents are still together and our grandparents were together until death. I just saw marriage as part of family life. My parents, the Bible and alot of books on marriage (I'm a book worm when it comes to books with wisdom contained). My parents divorced when I was 9. My grandparents were married for 55 years until my grandmother's passing. They were my inspiration. My grandmother was the best model of a wife I could have ever had. Their marriage wasn't without issue but the love, patience and dedication they modeled set the bar for me.